I haven't got very many patterns, but most of the ones I do have are vintage and battered. (I realize I'm making myself out to look like a liar with this picture, in which one pattern is brand spanking new and the other is battered, but not very old at all. These patterns aren't typical!) I keep my patterns in two Ikea boxes on a shelf in my room. I have them sorted by category--dresses, skirts, shirts, pants, children's patterns, doll clothes patterns, and accessories. In the white box, I have the first pattern in each category upright to make it easy to see where each category ends. The blue box is too narrow to hold a pattern sideways, so all the patterns in there are upright. When I decided to sort my patterns out like this, I had trouble originally. 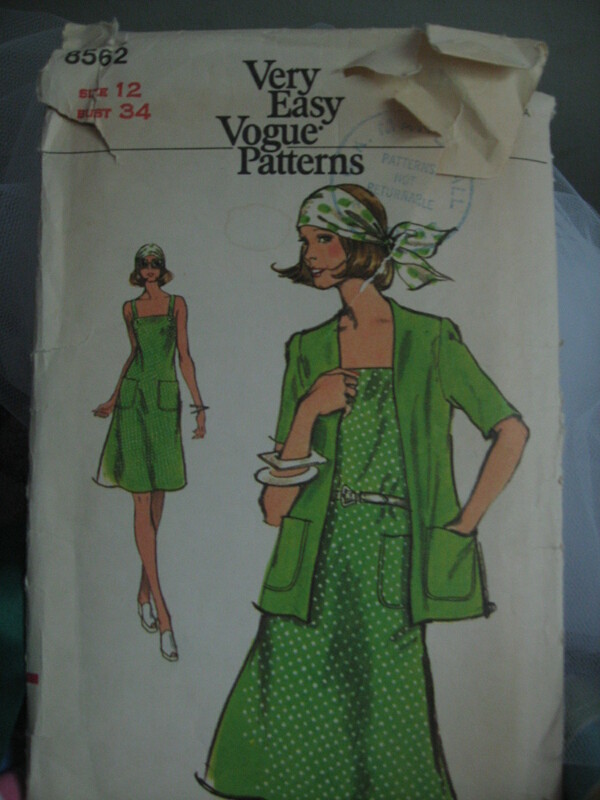 A lot of my patterns fit into more than one category, like my Very Easy Vogue 8562 that I mentioned in this post. This pattern is a dress as well as a jacket. 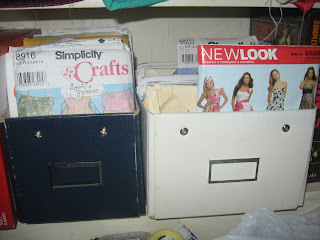 I was initially attracted to this pattern for the dress, so I put it into the dresses section and put a photocopy of the pattern envelope into the shirts section, with a note that the actual pattern could be found among the dresses. I did the same thing with all my other patterns, putting them into whichever category I thought I would be most likely to use them as. Inside the sections, my patterns aren't organized. I have a terrible time remembering pattern numbers, so organizing them by pattern number wouldn't really help, unless I saw a pattern on the internet or in the store and wanted to know if I had it already. But that doesn't happen very often. Besides, I only have about 50 or maybe 75 patterns--it doesn't take that long to pull out all my dresses, say, and flip through them. As I get more patterns, I'll have to figure something else out, but for now, this works for me!